When my husband was transferred in 1993 -- from land-locked Dallas, Texas to coastal Vancouver, British Columbia -- we decided to live on a boat. It wasnt a huge step for us -- we had long planned to sail off into the sunset. Thats the one with palm trees and pelicans mind you, but Vancouver looked like a good chance to hone up our boating skills. The idea of living aboard was so romantic, so unconventional, so Jimmy Buffett, that it almost made up for leaving Texas. We particularly liked the notion that whenever the mood struck, we could slip our ropes and not even the bosses would be able to track us down. Plus we arent normal people. 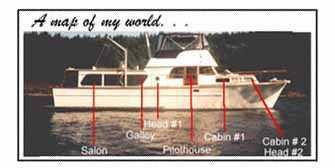 You need a certain screw loose to live on a boat and I say that with the utmost respect for my fellow liveaboards. Were writers and I daresay that qualifies us. Before we set foot in a prospective boat, we made up a check list. 34 pages. From engine and tank specifications to placement of electric sockets. We narrowed our search in the local boat trading magazines with inquisitive phone calls. Only eight boats seemed to meet our criteria. We got some looks when we came aboard with the list, particularly from boat brokers (go figure, theyre trying to sell it and were dissecting it). But it was invaluable in helping us rate the boats later, and in remembering them during the process. There was one boat, the third we saw, that we both fell for. She had classic lines (Grand Mariner design), good karma and even better yet, was priced right. Being new in town we were relying heavily on boat broker advice regarding financing. He put us onto a bank (one of "The Big Five" in Canada) who wanted nothing to do with boat mortgages in the center of the countrys boating capital. The broker was useless when we relayed this to him. So, pressed for time (we had a week to prearrange our new life prior to moving), we moved onto the next five boats. That broker lost an easy commission. To this day I wonder off and on about that boat. If youre in this position, pick up the phone. We snagged a mortgage in a heartbeat, on a boat worth twice the Grand Mariners price, later that week with a different bank. Why? Because another broker worked the sale. 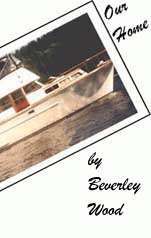 Once we had found the boat we wanted and received a commitment, in principle, for financing -- we hired a surveyor. This is crucial for your own protection and a prerequisite for financing. Make sure it is a reliable surveyor -- call the local boating associations and get references. Have an out-of-water survey done. You will have to pay the boat haul charges and survey fees (combined total, in British Columbia, of about $500 and worth every penny). Do not use a surveyor recommended by the broker! In fact, keep the following in mind about boat brokers: In most locations, they are not licensed (thats scary). They earn more than real estate agents (10% commission compared to 6%) and there is little recourse for you if you have been misled. Caveat Emptor (Buyer Beware) applies in spades. So, now we had a boat. All we needed was a place to put it. Easier said than done. Surprising in a coastal city Vancouvers size but frankly, its an unfriendly boat city. Extremely unfriendly to liveaboards. Check your options for moorage before you buy -- dont assume anything. In fact, check your options before you even think about buying -- and put it on your check list. Moorage is not cheap and of course it varies around the world. From about $200 per month in Hong Kong to $1100 per month in Boston. In downtown Vancouver, we pay $10 CND per foot, per month, plus tax ($547.20 CND) -- plus hydro, plus telephone, plus parking. Nothing about boating is cheap. If youre considering this lifestyle, you probably already know that. If you dont, I strongly suggest your first step be to buy a weekend boat and learn the ropes. It certainly has its rewards. If youre convinced its the life you want, then you should do it. But trust me. It really helps to have a screw loose. DogStar. . . a new fiction novel written with her husband, Chris Wood (Canadian pub date: Nov/97; USA pub date: March/98). In 1993, Chris convinced her to leave a sprawling Texas ranch and move onto a 48-foot boat in Vancouver's Burrard Inlet. She has never been the same since. Click here to e-mail Beverley. Originally posted Feb. 2, 1998. Text copyright Beverley Wood, 1998. Part of the original Sideroad.